Merry Christmas Josje and best wishes for the coming year. 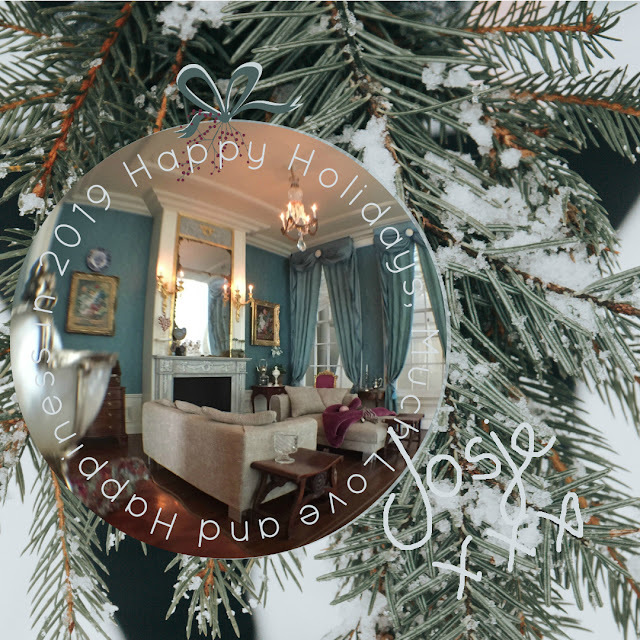 Merry After Christmas and a Happy 2019 to you Josje! I have just discovered you blog. It is so elegant! Happy Holidays to you. I was just reminded of the competition you ran many years ago where we were asked to name a favourite architect, or architectural style. I won your narwhal tusk mounted on a wooden board. I still have it and treasure it. Thank you! Hi Josie, I was having trouble leaving comments - not just here but generally. It seems to have corrected. So, I do hope you had a lovely Christmas and wish you a safe and healthy 2019... can hardly believe I am typing that date! De kerstdagen zijn inmiddels voorbij maar ik wens jou een gelukkig nieuwjaar toe. Dat 2019 maar veel mooie miniaturen en ander poppenhuisplezier mag brengen.